Muck boots and waders sinking deep into freshly deposited silt, the scientists and natural resource technicians of the Skagit River System Cooperative (SRSC) slog across what was, for the last 100-plus years, farmland. Water slowly crests the small channels that snake through the site and begins to seep across fields that still bear faint scars from disc plows. But it’s not fresh water released to irrigate barley or seed crops. The shimmer atop these Fir Island Farm fields this mid-February morning is a briny blend of groundwater and the Skagit Bay seawater that’s flooding in with the rising tide. The brackish water would be poisonous to crops, but it’s ideal for young Chinook salmon. “Salinity 4.2, temp 4.6, depth 1.5 meters,” calls out tech Jason Boome from a small metal boat floating in the middle of No Name Slough. Rich Henderson, SRCS’s Senior Field Operations Manager, checks his GPS and marks the spot for the first sampling trawl. He hands the end of a beach seine with miniscule mesh to Jade Luckhurst, who climbs into the boat as Jason reverses the outboard. They pull the 80-foot-long net out into the channel in a smooth arc and then return it to the muddy shoreline where Rich and tech Ric Haase immediately begin retrieving it. As the seine closes and sweeps towards shore, everyone crowds around and stares into the brown water. Finally, the mesh surfaces. Luckhurst plucks a small, translucent critter out of the net. “Mysid,” he says, before dropping it and a few others back into the channel. Shrimp don’t live in potato patches, so that’s a good sign. But it’s not what the monitoring team is looking for. Henderson starts counting off paces to the next sampling spot while everyone else helps pile the net back into its plastic bin then picks up the rest of the gear and follows him. In typically mercurial February fashion, the early morning frost covering Skagit’s farmlands had shrugged off a thick blanket of fog that spread over the valley and then suddenly vaporized in a blast of brilliant sunshine. “Longjohns and suntan lotion,” laughs Beamer, who’d started the day back in SRSC’s fisheries offices in LaConner, discussing the new EPA-funded Chinook Implementation Strategy (IS), an ambitious plan to coordinate regional Chinook recovery across state and federal agencies, tribes and NGO’s. The Chinook IS is also, in part, an SOS. 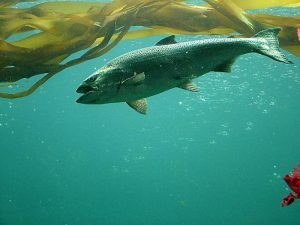 Call them an “indicator,” “keystone” or “umbrella,” no other species is as important to the overall recovery of Puget Sound as the Chinook salmon, which connects to veritably every other aspect of the health and happiness of the Sound’s ecosystem and its residents. From killer whales to cultural practices, water quality to recreational fishing: as go the Chinook, so goes Puget Sound. And the news on Chinook is not good. With the Chinook Vital Sign heading in the wrong direction — none of the wild Chinook stocks are consistently meeting population goals and most of them continue to lose ground — the state reached out to local partners in order to find out what could be done at the regional level to help accelerate Chinook recovery. According to Vynne, that new strategy charts hundreds of steps needed to move recovery forward, along with their estimated impact, feasibility and certainty of success. 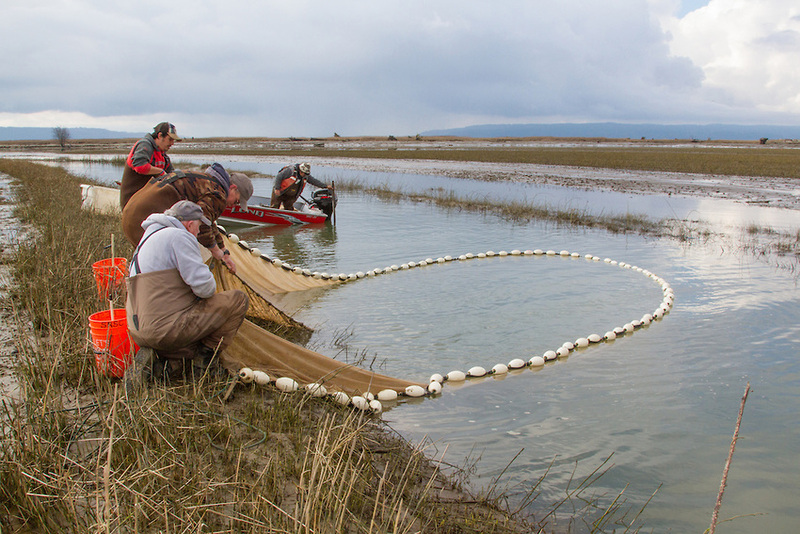 While still under review, its framers hope it provides a launching point for a regional workplan to advance salmon recovery. A desire to come up with “bold actions” for rebuilding Chinook salmon runs in Puget Sound has slowed approval of the first Chinook Implementation Strategy designed to accelerate recovery efforts for the threatened species. Such a workplan would be broad, ranging from habitat restoration to education and outreach, better funding for local partners, streamlining of permits and prioritization of research. This sounds promising to Eric Beamer who, during his three decades working to recover Skagit River salmon, has run headlong into all these issues. “We foresaw the ESA listing of wild Chinook back in 1994 — five years before they were listed — and thought ‘Let’s get ahead of the curve and do some research.’” Their science informed a set of goals for the Skagit watershed expressed in solid figures such as the number of additional Chinook smolts that need to make it out of the river, and the acres of habitat they need to either protect or restore. There are no wild Chinook without healthy habitat, and Beamer’s no-brainer illustration for the Skagit shows that they can reach 61% of their recovery goal simply by protecting the natural habitat that already exists — which is also the cheapest and easiest conservation method. The next priority is habitat restoration, which is neither cheap nor easy. 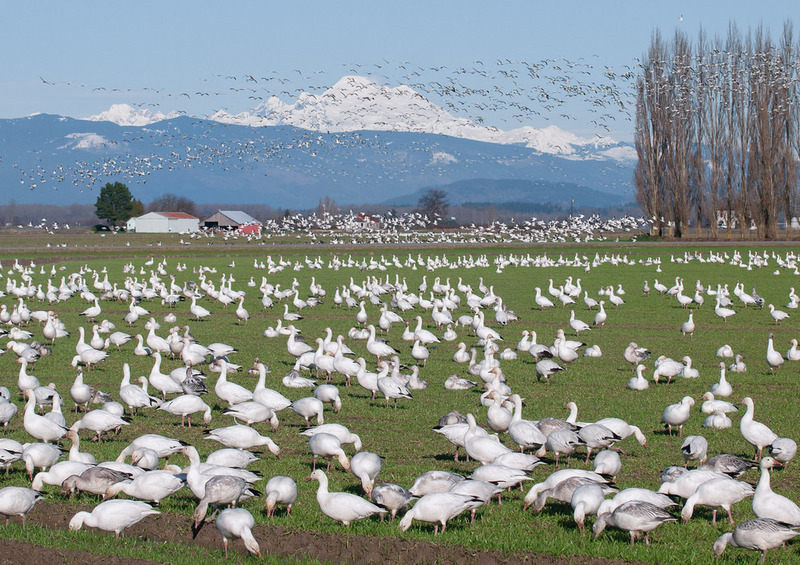 "some 98% of the freshwater wetlands and floodplain forest between Skagit Bay and the foothills of the Cascades have been lost to logging, agriculture and development." The drive out to the Fir Island Farm Estuary Restoration Project clearly lays out the challenges for the Skagit. Although this watershed is considered the healthiest and most intact in Puget Sound (boasting runs of all five salmon species plus steelhead and coastal cutthroats, and producing more than half of the Sound’s wild Chinook) some 98% of the freshwater wetlands and floodplain forest between Skagit Bay and the foothills of the Cascades have been lost to logging, agriculture and development. The view from the top of the bridge crossing the North Fork of the Skagit where the river historically spread out into its tidal delta is now farms as far as you can see. The vibrant agricultural community here has been working this rich land for more than 100 years and they produce a remarkable bounty of seed crops, cattle feed, berries, dairy cattle and, of course, Skagit’s famous flowers, with some 20 million bulbs and 75 million cut flowers harvested in the county each year. 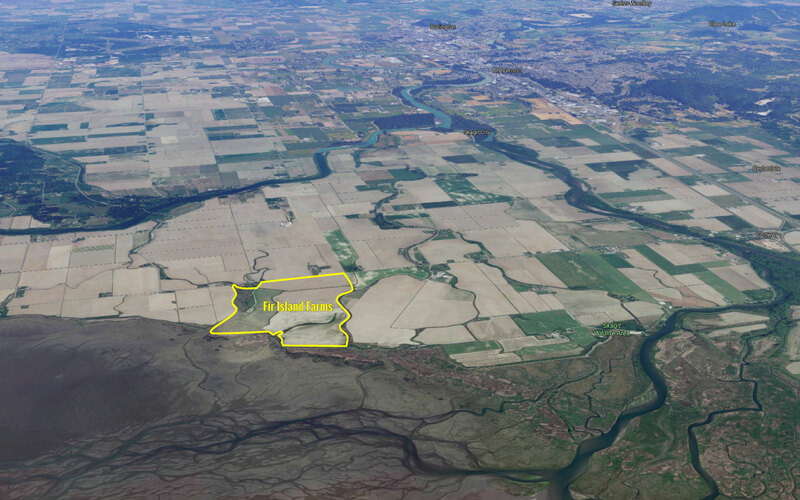 However, Skagit’s 65,000 acres of delta farmland is below the high tide mark, and to make it usable takes 147 miles of levees and dikes that constrict the river and hold back the bay. The dikes also prevent salmon from utilizing what was, since the last ice age, much of their most critical rearing habitat, the shallow, protected areas with a tidal mixing of fresh and salt water where they can spend time growing, gaining strength, and transforming from freshwater fry to estuarine smolts that can then migrate out to sea. Despite some impressive habitat gains achieved since 2004 through dike breaches and setbacks, fill removal and other estuarine projects, Beamer estimates that at the current rate of restoration it will take at least another 60 years to reach their goals for the Skagit delta. 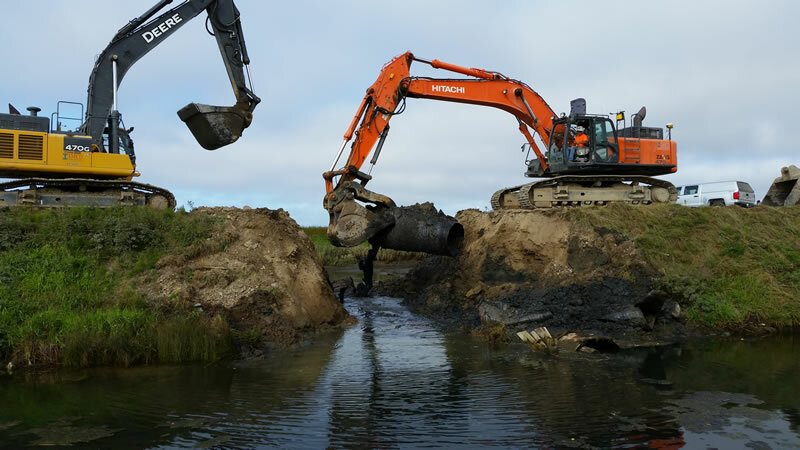 Down at the Fir Island restoration site, the SRSC monitoring team is still hoping to find signs that this site is becoming a functioning ecosystem after the old dike was breached in August 2016. This spring is the first chance Chinook fry would have to find their way here. Luckhurst jokes that maybe the crew should have brought a barbecue to cook all the shrimp they’re catching. Fir Island is a good example of the difficulty facing those working for Puget Sound salmon recovery. Even though the project took place on state land, it still took years to get moving. Another nearby project on the Skagit took six years to complete even though it was on private land purchased specifically for fish habitat restoration. Fir Island was a complex, difficult and expensive undertaking that entailed the construction of 5,800 feet of new diking, a large flood-control reservoir, pumping station, tidegates and pilot channels before the old dike could finally be breached and tidal flow restored to 131 acres of estuary habitat. For now at least, Fir Island is also a less than ideal restoration since the new habitat is not directly connected to the river. Any fish that noses into No Name Slough or Fir Island’s other channels will first have had to brave a section of Skagit Bay’s nearshore environment. Left unspoken is “If they show up.” But that doubt would go against everything they’ve learned here on the Skagit. Beamer’s research has shown that there are more than enough Chinook fry for the habitat currently available to the fish. By this reasoning, increasing the number of Chinook fry that make it into the nearshore waters (and then out to the ocean and ultimately back to the river to spawn) is a “simple” matter of increasing the quality and quantity of their rearing habitat. 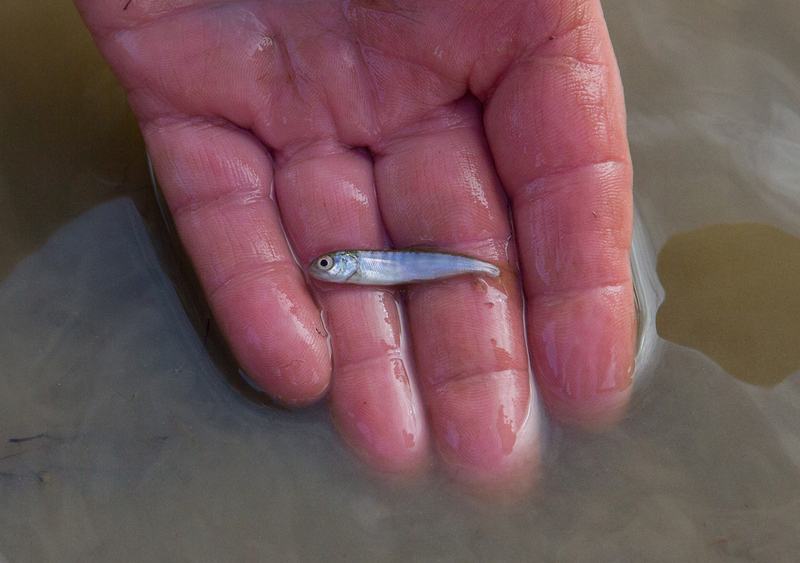 The Fir Island project alone is projected to enable at least an additional 65,000 fry to survive, a nice chunk of the total Skagit watershed goal of 1.35 million more wild Chinook fry through habitat restoration. If the theory is correct, it means there are already many thousands of tiny “excess” fry pouring out of the Skagit River and desperately trying to find suitable estuarine habitat to use as refuge where they can feed and grow and go through their physiological changes. If it’s correct. The only way to tell is by monitoring. The SRSC crew does this almost every day, hauling nets to sample sites on the river, along the shore and out in the deep waters of the Salish Sea. But it’s clear that this is something special.